I have DIY Gen7 V1.5 board with with uploaded bootloader and Marlin 1.0.0. software. I'm trying to connect Gen7 with Printrun 2014.08.01 sw on Ubuntu 14.04. But my bord always stuck on "Connecting..."
I can also turn off and on power supply over M80 and M81 codes. I notice when I establish connection over serial terminal and then start Prontface connection is done. 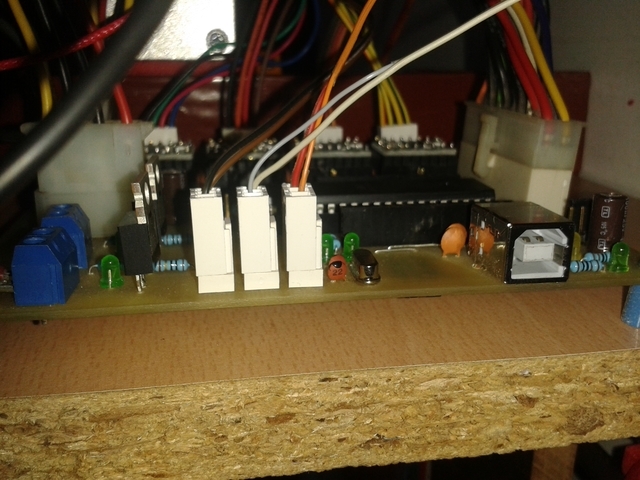 And then I can control my board over Printrun. Does anybody have or had similar problems? I found on internet that some "sleep times parameters" in Printrun scripts should be changed but i can't find this parameters in my version of Printrun. Well done, your Gen7 actually works. Your problem is entirely on the software side. There was a problem when Pronterface whould send out M105 every second, prohibiting the bootloader to finish his 3 seconds waiting time. looks like i use old version. Please put link to latest. I check this issue, and found code in printcore.py from line 278 Bug should be fixed in latest version. But for some reason for me is not working. I burn Marlin directly without bootloader and works perfectly! In future i will put back bootloader, and try to figure what is going on. Now I'm going to metalwork on my Prusa. 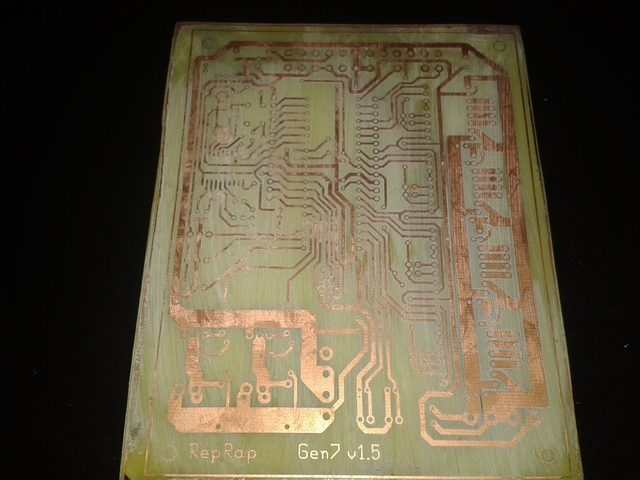 I need tanks to everyone who participate in developing RepRaps. My project revived week ago. I build Prusa with minor changes on construction. 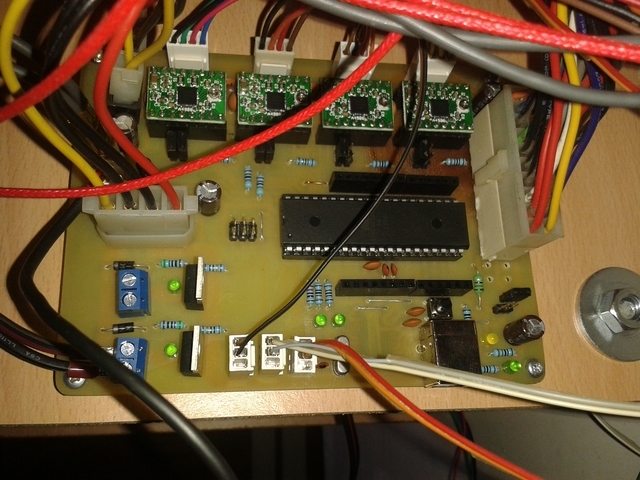 Electronic is Gen7 v 1.5 with ATmega1284P on 20 MHz with Marlin software without boot loader(issue above). I started to build my own hot end from beginning but i quickly realized that my concept of hotend was completely wrong. Now i stick on j-hed concept. Currently i waiting PTFE tube so project is on rest. 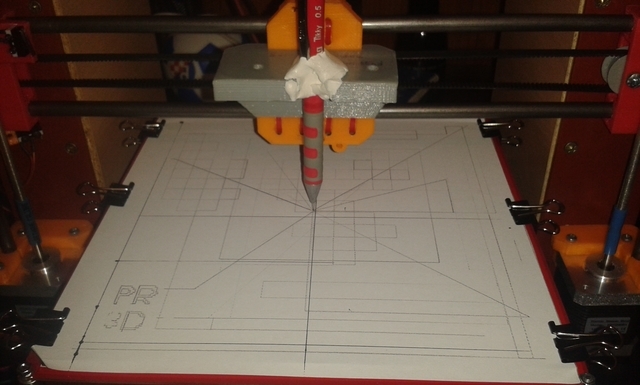 Yesterday I calibrate x-y axis and I'm surprised by achieved precision. I newer see someone to do this on that way. I glued with Pritt "MULTI TACK" pencil on hot end holder. That way i was able to draw lines on paper attached on top of bed. I measure distance and according to deviation I correct values in configuration.h. 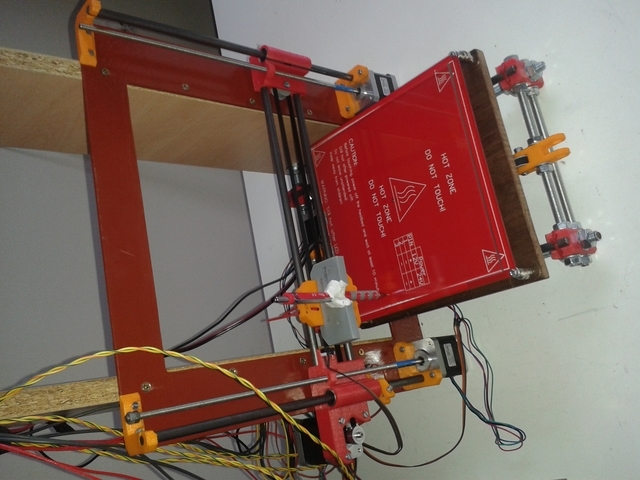 I hope at last that I will be able to print usable parts. 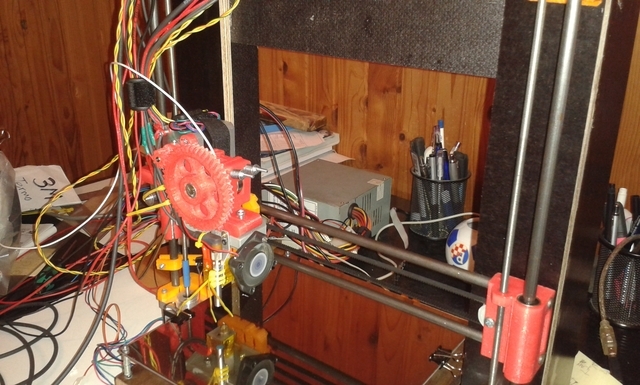 Here is some pictures of my printer and electronic. 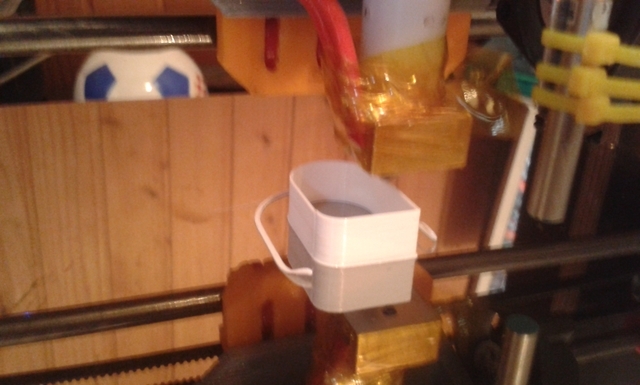 Today, first time in my history, I print first 3D parts on DIY prusa i3. It's been over a year since the decision to go in construction. I'm very satisfied with quality. 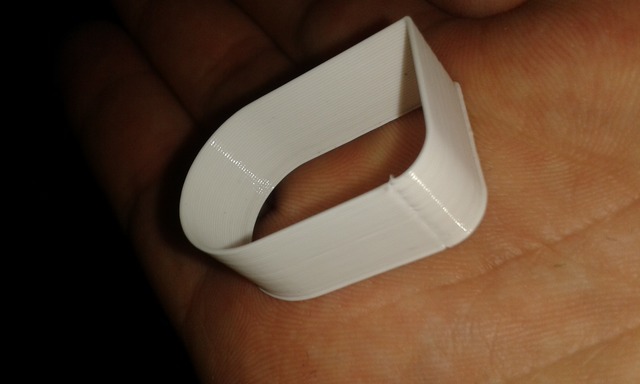 I use 1.75mm PLA filament with 0.5mm nozzle diameter on hot end. I didn't use any adhesive on heat bed, only pure stainless steel(inox) 1.5mm table warmed to 60°C. 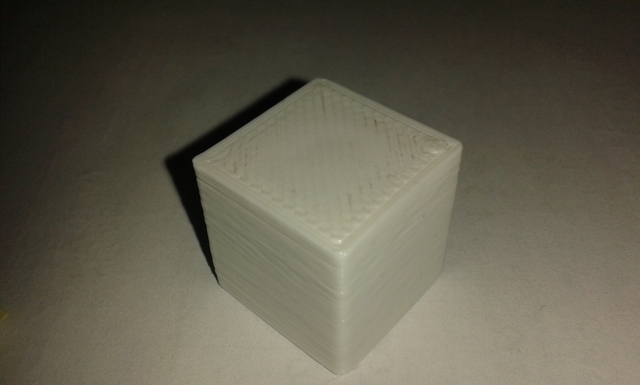 Bottom of the 2 cm printed cube is little warped, and rest of cube is nice, complete cube is unbreakable. Adhesion to inox is not strong and I need to find some solution for this. 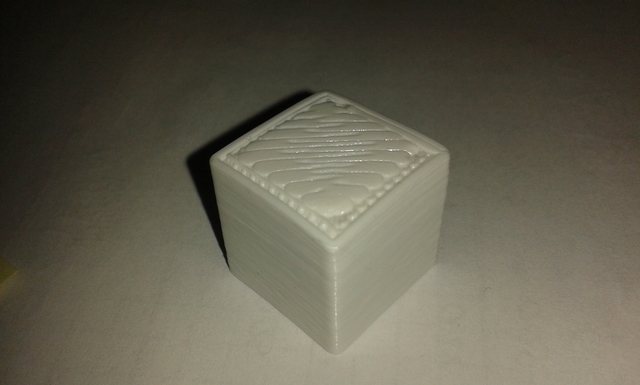 I think that this is main reason for warping of cube at the bottom. I can tell that auto bed tramming on gen7 v1.5 and marlin v1.0.2 software works without any problems. I em thrilled with infill pattern honeycomb. How nicely printer construct this pattern on every slice. 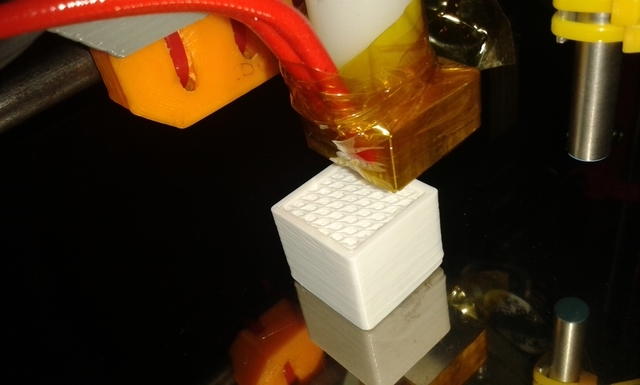 It was not everything so nice, all attempts to print without auto bed tramming failed, also i had twice changed internal construction of hot end, also frame has been changed. Next I will edit wiring of printer.